He used to sell Coke and charge a hefty sum for that. Now he is selling concerns and is charging an equally hefty sum for that as well. When he used to sell Coke, he did not bother much with what it was doing to the lives of people of Plachimada. Now, when he is peddling the stories of pain, he seems to be least bothered with finer nuances that shape and sustain these miseries. Welcome Amir Khan. India has found a new crusader in him. This one is going to be no ordinary one on that. This one is not merely concerned; he is feeling the pain of the people. He is feeling it so much that his eyes well up more often than the person recounting the tales of injustices done to her. He has awakened the middle classes, the engine on which lay all the hopes of India becoming a super power, to the miseries that plague the lives of countless poor. He has done more, in fact. He has awakened the middle classes to the existence of another India, of which they were so blissfully unaware of till now. In addition, he has done this all with style. A style that not only suits the superhero, but also accentuates his mass appeal, alas, no new movies of him are going to hit the screens to reap the benefits. What better place than a studio, then, could he find to execute this great service to humanity, okay, Indians? The studios, after all, come up as the metaphor for the middle classes. Being a miniscule minority of the vast masses that constitute Indian democracy, they would had been an inconsequential lot but for these studios. They are the ones who do not vote. They are the ones who do not participate in the democratic process. They are the ones who declare politics to be 'dirty' and then wash their hands off it instead of attempting to clean it. Washing their hands off things, though, comes naturally to them. Have not they washed their hands off almost everything that matters for the broader population? Yet, they matter and often matter more than rest of Indians put together. Their voice, the voice of less than 10 per cent of Indian citizens, becomes the 'voice of the nation'. Self-appointed conscience keepers, Arnab Goswami comes readily to mind, become the conscience keepers of the nation. The site of their protests, if you have not already forgotten Anna Hazare and his team that ganged up to scuffle the voices of sanity and social justice, become the 'Tahreer Chowk' of India. Their leaders like Arvind Kejriwal, that is if even after getting dumped by 'one-flight-two reimbursements fame Kiran Bedi' he still is the leader, become the harbingers of Arab Spring in India. It is just the strength of this media that makes people forget that this Kejriwal has been a vocal opponent of reservations for the Other Backward Communities and thus cannot claim to represent a huge section of impoverished and underprivileged India forget being harbinger of any change, good or bad, in the body politic of the nation. These are the studios that turn justice for Jessica into everyone's cause, justifiably so, and bring the high and mighty to justice. These are the same studios, then, which assassinate the character of slain Bhanwari Devi of Rajasthan, perhaps because she did not 'belong' to the caste and class background the studios cater to. Yet, despite all these problems of having a definite ideology of their own, an ideology that emanates from their vested interests and entrenched in system ownerships, these studios, perhaps, are the only positive change neoliberalism has brought to India. They, after all, give some strength to 'common people'; even if these 'common people' are not that common after all. The superhero, therefore, chose the studio to spell out his magic formulae, Satyamev Jayate, Truth Shall win, and started bringing different realities in front of everyone. It is just that he was careful enough not to bring these realities in their raw form as they are administered over the hapless victims. He sliced and manicured it for TV viewing. And the timing was appropriate too, it would not eat into the so called productive hours of the working India, after all who can waste time on social issues when the stock markets are waiting? Middle classes were so thankful to him, what else they could be? He gave them their window into what was happening in the 'other' India. Were they hardly aware of even its existence till the other day? I remember watching an episode of Satyamev Jayate with a friend, horror written all over her face. She looked genuinely troubled with all she got to know that night. Amir Khan had successfully opened her eyes. These places are so far removed from reality, she told me while struggling to come out of the shock. This is exactly what celebrity activism, that too on television, does in reality. It makes tragedies of other people and entertainment of the viewer. Okay, I concede that calling it 'entertainment' might be a little harsh, so let us settle at distractions at least. It makes one aware of how 'lucky' he is to be where he is and not in those hellholes being delivered on his 42 inch LCD screen. Sliced, manicured and sanitized pieces of reality made consumable with the delicacies spread out on the dining table. It makes their detachment with that India complete making them thank their gods, yup, most of them do believe in gods, for being so merciful to them. And then, it makes them look concerned and that is where lies the real importance of being Amir Khan. 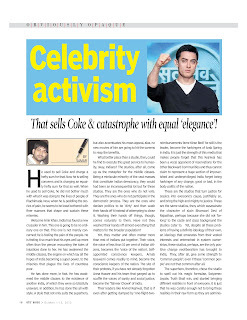 If not for Amir Khan, how would they know that female infanticide does not only exist, but also is evil? If not for him, how would they ever know that barbaric atrocities in the name of caste are committed against Dalits, fellow citizens of our country, everyday? The fact that he would forget to mention Babasaheb Bhimrao Ambedkar even while talking of caste over two episodes jells with the mindsets and psyche of this class as well. Why would they want to remember, much less salute, the fellow who led the ferocious charge of the downtrodden, the Dalits, on their Brahminical heaven? Most of them despise him just as much as we revere him for breaking the gates open for the dispossessed and a mention of him would certainly have punctured the pretensions of being concerned. That is why Gandhi was there, many others were there but Babasaheb, no, he is still not fit for the 'tastes' of the middle classes that make most of the viewership of such shows. Coming back to the show, I am sure that without Amir Khan telling them on TV screens that there is widespread malpractice and corruption, they would have been naïve enough to believe that it was a 'good' world out there. Visualise this, a well to do family blissfully devouring its weekend meal and witnessing the shock, awe and despair writ on the faces of the audience. Then comes in the camera, the mystical weapon Amir's crew deploys with such élan. Every time it finds a moment to play with, it moves closer, gets slower and delivers us the shock, the awe or the admiration of the audience out there. To emphasize the ‘realness’ of the reality, even the superhero shows his raw emotions and sheds a few tears. That is where the performance reaches its peak. The realities, even the sanitized ones, are bad enough to make even a superhero cry and if they can make him cry, what on the earth would stop us from identifying with the cause. His precious tears make the erstwhile forgotten issue quickly scale up the ladder. It soon becomes a serious one demanding utmost importance. They give it that as well, by outpouring their disgust with the system on social media, facebook leading the pack. Having done 'their bit' brings them back to normalcy, make them happily finish their dinner. They pop in the weekend pill of social awakening doled out to them by Amir Khan, and go about nimbly for the rest of the week. During the week, they gush about how ‘good’ the previous episode was (never mind the fact that it exposed everyday gruesome realities). This is not Amir Khan's fault, one may assert. It certainly is not. It is symptomatic of the mess we have turned India into. Just think about it that it needs a celebrity to make people aware of the problems that they deal with everyday. 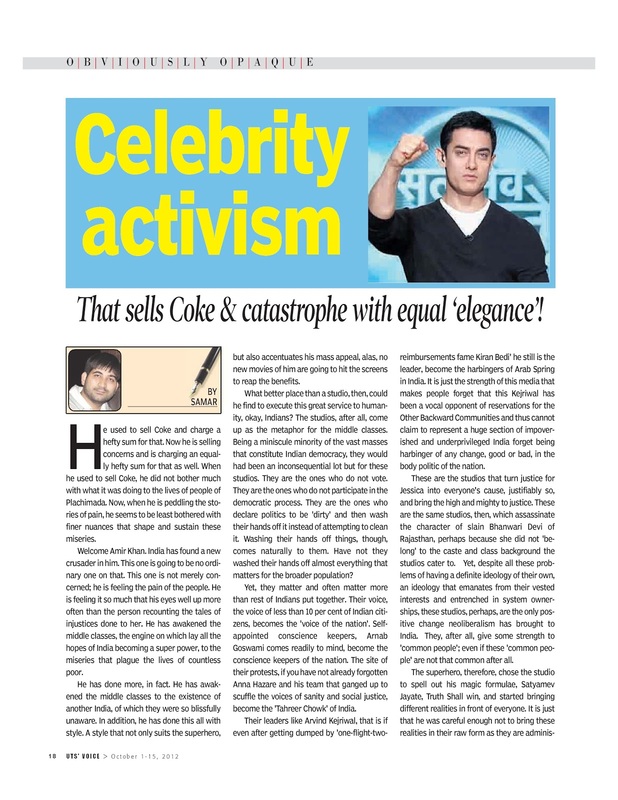 Think of the policy makers addressing these problems only when a celebrity takes them up. All this in a country that claims to be a democracy. Does not the constitution give people a right to get heard to? Does it not bestow in them a power to make the government respond to their woes? It did not envisage the role of celebrities to be middlemen between the people and their elected elders. That is the problem with celebrity activism. The celebrities institutionalize the hierarchies that give the governments the luxury of attending to a few problems while turning away from all other. The elebrities have another luxury. Unlike lesser mortals like us, they can pick and choose their struggles. A villager in Narmada valley does not have this choice. Neither does an adivasi of Bastar. 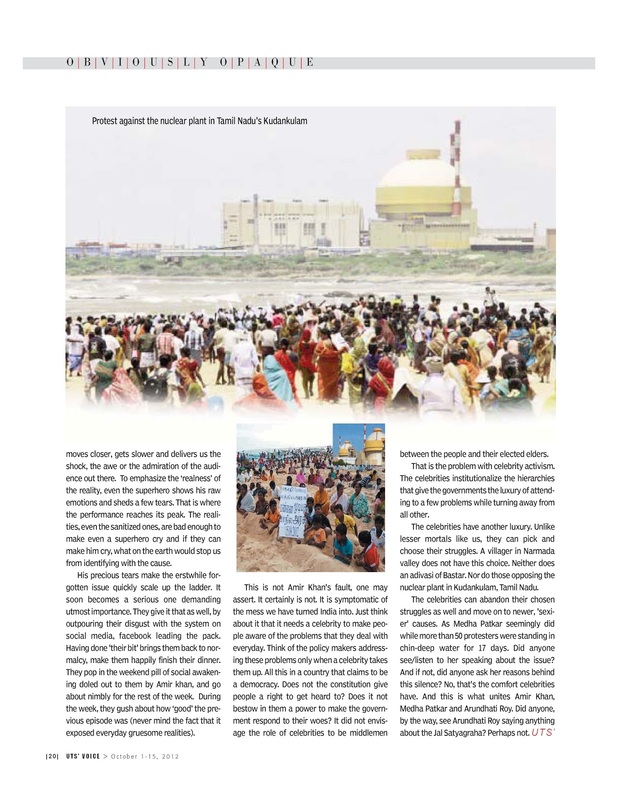 Nor do those opposing the nuclear plant in Kudankulam, Tamil Nadu. The celebrities can abandon their chosen struggles as well. 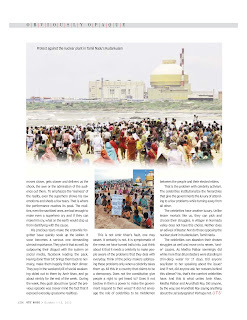 As Medha Patkar seemingly did while more than 50 protesters were standing in chin-deep water for 17 days. Did anyone see/listen to her speaking about the issue? And if not, did anyone ask her reasons behind this silence? Or they can move on to newer, 'sexier' causes.Now, that's the comfort celebrities have. And this is what unites Amir Khan, Medha Patkar and Arundhati Roy. Did anyone, by the way, see Arundhati Roy saying anything about the Jal Satyagraha? Perhaps not. A good collage of events. Thanks.